-China’s largest cinema chain takes a dim view of the domestic movie industry. In the risk factors section, the prospectus notes that “while Chinese films have achieved a certain volume, there are relatively few films of commercial value” and regulations limit foreign film imports. Therefore, Wanda faces risks resulting from the “lack of quality films in China that can really win good praise and reviews and completely satisfy market needs and the cultural demands of viewers.” Oliver Stone would probably agree. Having raised USD $314 million from the AMC IPO Mr Wang (and family) have clearly got a taste for the riches that cinema IPOs can offer. 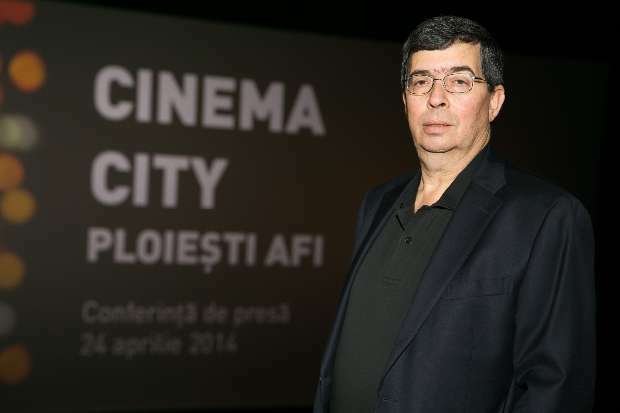 Romania: An interview with Moshe Greidinger, CEO of Cinema City (which is merging with Cineworld but keeping its brand), about plans for Romania and beyond. It seems like most of the future growth is to be expected in the Central and Eastern Europe market. One or two more Imax cinemas are planned for Romania and apparently they cost two million euros to open. Poland is the exhibitors biggest market, then Israel followed by Romania and Hungary. Q: What is the expansion plan for Romania for the coming years? MG: We plan to open 22 new cinema’s in Romania between 2014 and 2016. We might be a bit late, as the shopping mall’s are built by developers, not by us. The economy also has an influence However, it looks that we are going to build around 22 cinemas. Romania is going to be the country were we will grow the most. Q: How many new openings do you plan for the rest of Europe for the next three years? Germany: Smartjog Ymagis has extended its E-Delivery network in Germany to a further five cinemas with a total of 36 screens. With digital cinema roll-out completing in Europe country-by-country, consolidation is to be expected with a handful of logistics operators such as Deluxe, Smartjog Ymagis and Unique Digital. Australia: The first outing of Tugg’s cinema-on-demand has taken place in Australia. The first US title from Tugg’s library to be screened in Australia will be Why We Ride, a US documentary about the passionate devotees of motorcycle riding, which played on more than 140 screens in 37 States. Following requests from residents of Alice Springs, the docu will be shown at the Alice Springs Cinema on May 11 and 13. Tickets are selling fast including among biking groups who plan to ride to the Alice for the screenings. 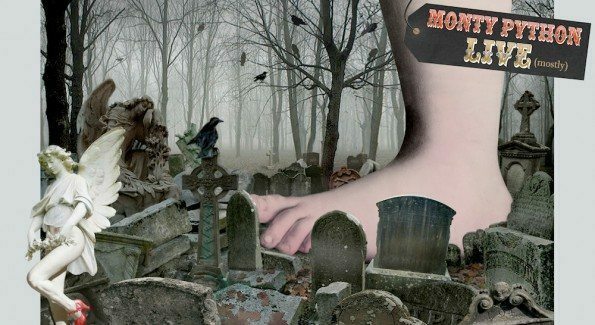 UK: As reported earlier in Celluloid Junkie, the Monty Python reunion show will be beamed to cinemas 20 July courtesy of Picturehouse Entertainment. USA (NY): Long Island’s Cinema Arts Centre narrowly escaped digital oblivion. “Without the digital equipment, we would have had to close for the simple reason that we would no longer have had the technical ability to show new movies,” explains Dylan Skolnick, the Cinema’s co-director. India: This past Saturday was World IP Day and it was marked in one of the industries hardest hit by film theft: Bollywood. On April 26, 2014, in association with strategic alliance partner, the Andhra Pradesh Film Chamber of Commerce (APFCC) and leading multiplex chains across the country, the MPDA launched an online quiz for multiplex staff entitled ‘Be A Movie Cop’. This initiative attempts to raise awareness on the threats and challenges of camcording in cinemas, while rewarding theatre staff with exciting prizes, including a ‘Movie Cop’ badge in recognition of their efforts to curb content theft in their cinemas. USA (MA): Here is a clever and funny YouTube video for the fundraising to help the Plimoth Cinema raise the funds needed to convert to digital. 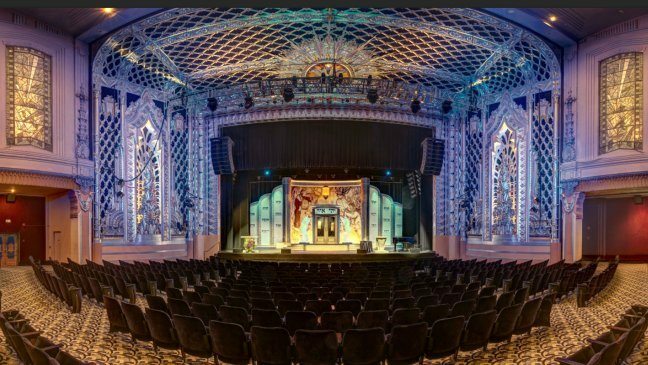 USA (CA): 1 May is the opening date announced for the The Steve Tisch Cinema Center at the Saban Theatre in Beverly Hills, which will coincide with the Los Angeles Jewish Film Festival’s gala honoring Carl Reiner and Sid Ceasar. The Saban Theatre, which opened in 1930 as the Fox Wilshire movie palace, was listed on the National Register of Historic Places in 2012. USA (AL): Carmike has announced the opening of a 13-screen multiplex in Opelika, Alabama on 1 May. Switzerland: Half a million Swiss Francs have been approved by the local Kanton government for the construction of a new cinema near Zurich, but Sfr 110,000 is still needed for the budget of Sfr 1.6 million. India: Inox is opening a multiplex on the principle of ‘small is beautiful’ in the southern Indian city of Visakhapatnam. The concept of ‘small is beautiful’ has been the guiding principle in the design, construction and leasing of the property. The built-up area of about 1 lakh square feet includes 55,000 sq. ft commercial space, 35,000 sq. ft. of multiplex and 15,000 sq. ft. of office space in future, spread over ground plus six floors. 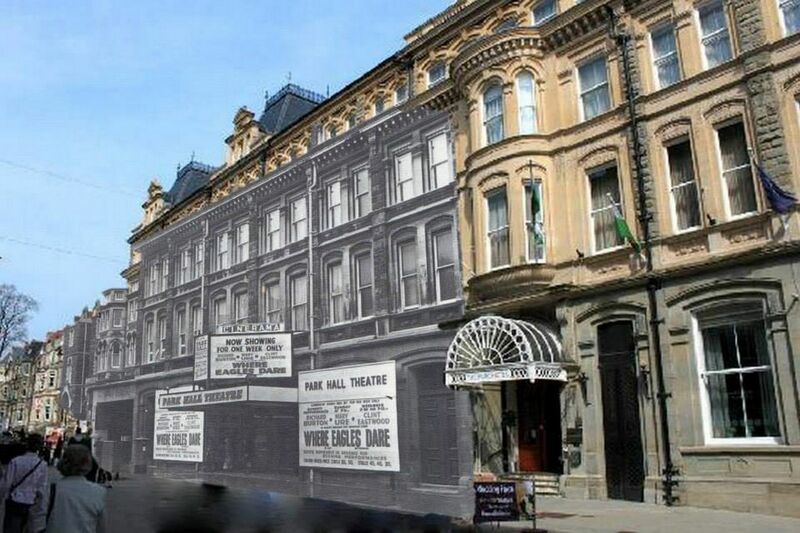 This has got to be one of the most clever cinema nostalgia things we have come across in a long time – images of old and closed cinemas in Wales’ Cardiff superimposed on their current buildings. From the giant 2,800-seater Capitol theatre on Queen Street, to the independent Monico in Rhiwbina many of us remember visiting in our youth, Cardiff has a rich movie-going past. 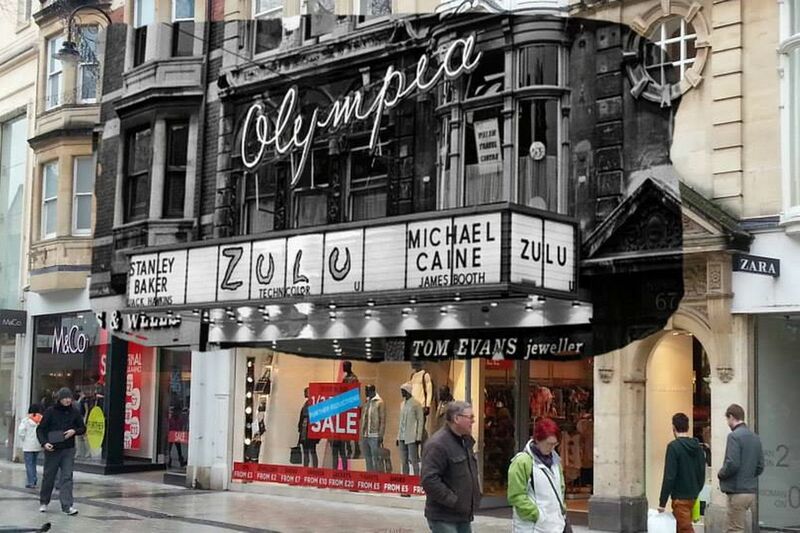 Sadly they are all gone – replaced by shopping complexes, bowling alleys and modern flats.